Nicodemus “came to Jesus by night” (John 3:1-17, Lent 2A). I wonder if that’s not true for all of us. I wonder if we don’t all come to Jesus by night. Some have said that Nicodemus was hiding in the darkness. He was embarrassed. He was scared and didn’t want to be seen or caught. Others have said Nicodemus wasn’t a true believer and that his faith was shallow and superficial. A few have even said it was just a matter of scheduling and night was the only time Nicodemus and Jesus could get together. Maybe, but I don’t think so. I don’t think it’s any of those. I think there is much more to it than that. St. John is using night in a particular way. It’s not our usual understanding of the word. St John is using it to describe a condition or a circumstance. In St. John’s account of the gospel night is that time, Jesus says, “when no one can work” (Jn. 9:4). Our usual daytime activities have no power or meaning in the night. We are unable to create and sustain our own life in the night. Elsewhere Jesus speaks of night as the time when we stumble because there is no light in us and we just can’t see the way forward (Jn. 11:10). Night is the separation, fragmentation, and division within us that can become betrayal of ourselves and others. Remember Judas? 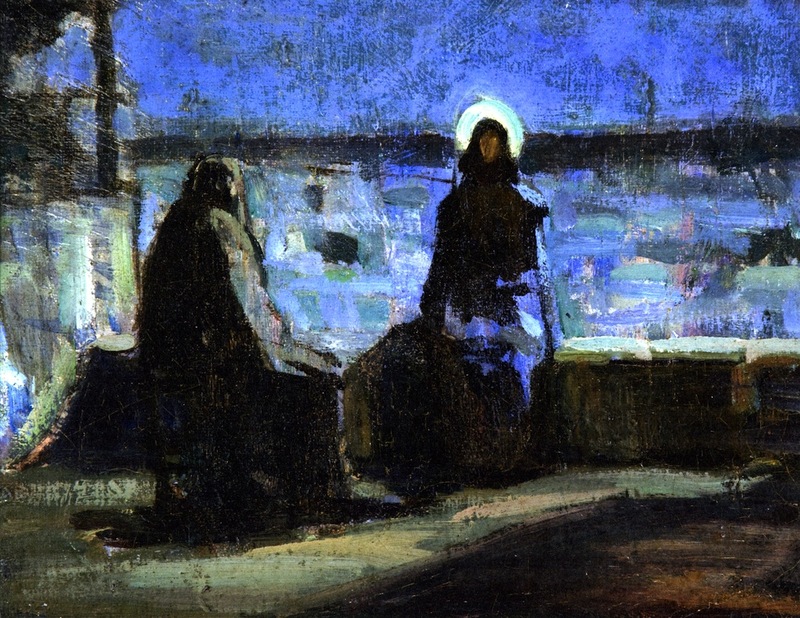 He got up and left the table, St. John writes, “and it was night” (Jn.13:30). Night describes those times we fish all night but catch nothing (Jn. 21:3). Our efforts prove fruitless and our nets remain empty. Coming to Jesus by night is not a statement about the time, Nicodemus’ motive, or his faith. It is, rather, a description of Nicodemus and his life, a description that probably fits all of us at one time or another. Coming by night is the recognition that there is a daytime Nicodemus and a nighttime Nicodemus; just as there is a daytime Mike and a nighttime Mike, a daytime you and a nighttime you. By day Nicodemus knows who he is. He has an identity. He is a Pharisee. He has a role and a reputation as a leader of the Jews. He knows and applies the law. People listen to and follow him. He has a particular place in society. He fits in. He has security and power. By night, however, Nicodemus is lost and confused. He cannot see or understand. Nothing makes sense. He’s in the dark, as we say. His work, accomplishments, reputation, and place in society no longer provide stability or answers. Everything has changed. He’s stumbling in the dark. Daytime certainty has given way to nighttime questions. “How can these things be?” By day he keeps the faith. By night, however, his nets come up empty. He’s looking for something the daytime life just cannot give him. We probably all know what that’s like. We live daytime lives and we live nighttime lives. By day all is well. We live with a sense of identity and security. We have a place and purpose. Our life has meaning and direction. Daytime reveals what is, but darkness reveals nothing. By night everything is hidden. We stumble through the darkness, grasping for something to hold, seeking answers and explanations for our life. Everything has been turned upside down and nothing is certain. In the dark life doesn’t make sense and we don’t understand. The night is a time of vulnerability, questions, and wrestling with life. We are almost always better at daytime living than nighttime living. We have been taught to live daytime lives. That’s what our world values, encourages, and rewards. We want to be daytime people. That means we spend our time looking for information and answers. We build our reputations. We desire recognition and approval. We establish our place in life. We buy stuff and gain wealth. We want predicability and control. We prefer what is safe and familiar. Daytime life is the life we create for ourselves. There’s nothing inherently wrong with that. We all do it and we need to. Some of those things are necessary. The problem is that daytime life keeps us stuck in the cycle of always having to create and re-create our lives. Somehow we can never get enough. We never quite get there. It seems that which we most want is always just beyond our grasp. That’s important information to know. It means we cannot keep doing the same old things and expect a different result. When we realize that about our self and our life we have entered the nighttime of life. Here’s the irony. The very life we create for ourselves often becomes the circumstances that take us into the darkness. We keep doing the same old thing but nothing changes. We’re so exhausted we can’t muster the energy to re-create our life one more time. We have everything we want, everything is fine, but something is lacking. Those and a thousand others like them are the start of our darkness. Most of us do whatever we can to avoid or get out of the darkness. Nighttime living isn’t much fun. It’s difficult, uncomfortable, even painful. It’s not our first choice. It is, however, necessary. That’s why we are marked with ashes and reminded of our mortality. We must remember that what is born of the flesh is flesh and that there is more to us and our lives than what we can create for ourselves. It’s why this season of Lent focuses on the very opposite of daytime living: letting go instead of possessing, hunger instead of fullness, self-denial instead of self-satisfaction, change instead of status quo, self-examination instead of blissful ignorance, and darkness rather than light. The great temptation in the nighttime is to think that if we just get the answer, if we can understand and explain it all, then we’ll know what to do. We’ll do it better this time. We’ll do it differently this time. Things will change and we’ll get what we want. That’s what Nicodemus is doing. “How can these things be?” He wants an answer, information. That’s just more daytime living and it doesn’t work in the nighttime of life. The nighttime of life is not a situation to be resolved, a problem to be figured out, or a question to be answered. As difficult and painful as it may be the nighttime of life is the womb by which we are born from above. The discomforts of the darkness are the contractions by which we are pushed into new life and born again. This nighttime birth changes everything about our daytime life. This second birth gives meaning to, completes, and fulfills our first birth. This, however, is the Spirit’s work not ours. We cannot birth ourselves. We can only feel and give way to the rhythm of the contractions. So don’t flee the darkness. Don’t fight the night. Let yourself be born. The contractions of the darkness are God reshaping, forming, and molding you in the likeness of Christ. Isn’t that what we really want? Isn’t that why we’ve shown up here today? Isn’t that what this holy season of Lent is about? Lent is our reminder that the nighttime of life, no matter how dark, is always filled with the promise of new life, full life, abundant life, God’s own life – what Jesus calls eternal life. Why settle for re-creating ourselves one more time when Christ is dying to give us a life we could never create for ourselves? Nightfall is a battle for many of us, a time when our past sins haunt us and fears visit us. I’m so glad that Jesus is available night and day and no appointment is needed! Beautiful! Thank you so much for that verse…I will memorize that one. Mike, I’ve been aware of the nighttime motif in the Fourth Gospel: night is coming when no one can work; Judas went out, and it was night; Simon Peter and colleagues toiled all night and caught nothing. But your connecting night with pregnancy — the gestation necessary for being born from above — that’s a compelling analogy. Thank you Lawrence. I’ve thought some more about that and also see it in the wilderness stories of Jesus and the Israelites, Jesus’ three days in the tomb, Jonah in the whale. There’s probably many others. I think it is the in between times, the threshold moments, liminal space, the dark night of St. John of the Cross. It also seems to me that we go through that more than once. The ritual of baptism, the new birth, happens only once, but we return to the baptismal waters over and over again throughout our lives. Blessings to you and Pansy for a Holy Lent. Nancee, thanks so much for reading my blog and sharing your interpretation. In some ways we are saying similar things – the temporal matters being daytime life and the eternal birth happening in the nighttime of life. I like your insight and imagery about the wind – to engage but not attach. That is very important. Don’t be surprised if you see that on this blog three years from now! My time at Sewanee was really good and formative. I hope it’s been good for you. Blessings on you and your studies. What a powerful post. The image of Nicodemus grinding away, thinking to himself if I only do it again, do it better, if I just keep pushing … And it’s all force, and it cannot be the space for something new to enter. There’s something about self-sufficiency that is so attractive isn’t there? Yet, after a while it begins to close and harden us. I can see how waiting for the fish to come would teach a different way.